I so want a pair! Unfortunately, they only come in a size 15 with 24 inch cables – not a size that I often use. Still, this is one of those knitting indulgence that you just want to say you own, like those two skeins of cashmere yarn that you rescued out of the sale bin even though you don’t like the color and now its four years later and you still don’t know what to make out of them because you wouldn’t really wear anything in that muted shade of green but if you’re going to knit with cashmere its going to be for yourself because no one else would really appreciate/deserve it as much as you so you just wait and hope that the right pattern will come along and that eventually you will learn to love that sage green. Yep, it’d be just like that! If I were to splurge on these needles they would be a happy addition to my knitting treasure trove. I would occasionally take them out of their box and dream about what wonderful project I would make with them and imagine what it would be like to work with them and then sigh happily (or maybe sadly depending on my mood) and then carefully put them away. 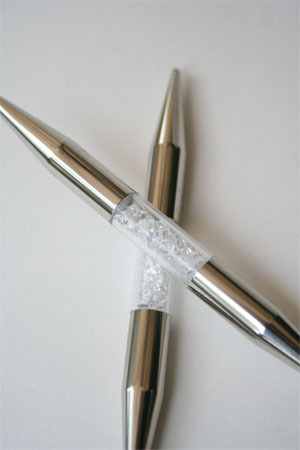 Another brand of needles that I want to try out are the Stiletto Points from Signature Needle Arts. As far as I can tell they have some of the sharpest tips in the market, or at least that’s how they advertise it. I might treat myself to a set of double points (either size 5 or 8) from them one day, because those I could really for finishing off the crown of a hat. I am also curious to use the Knitter’s Pride Karbonz Needles which is made out of carbon fiber just like the materials used in aircrafts. I first heard about them from a friend in my Philadelphia knitting group who was intrigued by their promise of durability. She bought them in the tiniest size available (double or triple zeros) so that she could knit socks and not have to worry about them breaking like her wooden ones or bending like her metal ones. As someone that is struggling with a pair of socks on size two needles, I can’t imagine using needles that small, but I do understand their value. I do have three pairs of BEAU-TI-FUL glass needles that I absolutely can and will recommend to anyone that loves a sharp point. They are from Flameworked Glass by Michael and Sheila Ernst; and I have them in sizes 8, 9 and 10. This is true craftsmanship. I first admired these needles at their booth in the Maryland Sheep & Wool Festival which I went to every year from 2005 to 2011 (I couldn’t go last year because I was in California, but I am so excited to go again this year). The cables are thicker than your standard circular needles, but the join is seamless. The glass is not only beautiful, but really smooth, so not the best needles to use with silk, bamboo, soy and other slippery yarns, but great with animal fibers. Also, because they are so slick your gauge might be a little tighter until you get accustomed to using them. They are such a pleasure to knit with – I love them and want more! Of course I’d be broke if I fulfilled all of my whims of owning these needles, but sometimes you need some designer tools to glamorize your knitting. What’s your most treasured knitting tool? 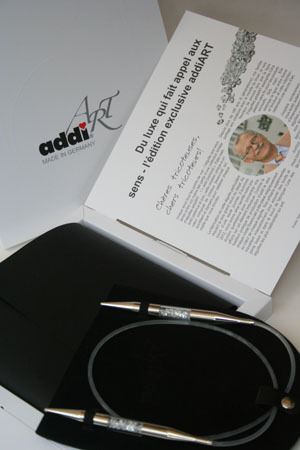 And what is the knitting tool that you are dreaming about? I love my Signature Needles. They’re what I use most when possible. Those Karbonz look pretty cool too.